Double-teams to double-takes, blue-chip blocking talent is turning heads in the 912. It was a good camp, the coaches helped me a lot. Told me...what I need to work on, what I'm best at right now and where I can still improve." As college football recruiting has reached a fever pitch in southeast Georgia, top prospects along the offensive line are becoming a major focus. Double-teams to double-takes, blue-chip blocking talent is turning heads in the 912. Following in the footsteps of those like Jalynn Strickland from the most recent class and Gage Blackston, Zalontae Hillery and Zach Quinney from the year before, players are moving on from local front fives to the front lines of the FBS. 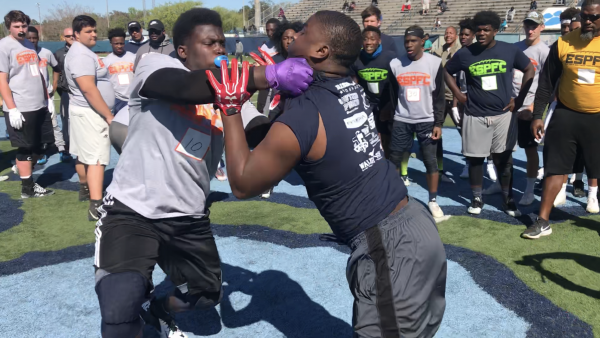 A number of rising stars were on display at Sunday's Explosive Southern Pigskin Football Camp in Kingsland, perhaps most notably Camden County freshman offensive lineman Micah Morris. At 6'5'', 280 pounds, Morris, who will be a sophomore when the season starts later this fall, already has offers from the game's elite: Alabama, Georgia, Ohio State, etc. Physically dominant but also athletically skilled, Morris is largely considered to be the complete package up front. His combination of size and strength, and acumen and agility, is truly rare. Morris will only add nuance to his young resume with more experience. Morris proved to be one of the afternoon's top talking points. "It was a good camp, the coaches helped me out a lot," Morris recapped. "Told me about my stance, my footwork, what I need to work on, what I'm best at right now and where I can still improve." Expect Morris to continue to develop and progress, all with an unwavering focus. Morris fits both the mold and the mindset of a big-time blocker. "Being able to hit defensive linemen," he quipped of his favorite part of playing the position. Class of 2019 interior lineman David Vann of Wayne County was named the camp's unit MVP by the coaches, a collection of former college and professional standouts. Vann displayed both strong fundamentals and a tenacity that impressed. Prior to group workouts, his effort in running the forty yard dash was notable during testing. Vann, at 6'3'', 273 pounds, can play either center or guard. "It was fun to come out and here compete," he added. Fellow Wayne County blocker Weston Franklin, another 2021 offensive lineman at almost 6'4'', 265 pounds, currently has an offer from Southern Mississippi. A freshman like Morris, Franklin's talents are especially-impressive given his youth. He, along with Vann, help continue the Yellow Jackets' proud tradition at the line of scrimmage. Additionally, Bradwell Institute's Devonte Walton, at 245 pounds, is a class of 2020 blocker who showed great balance and leverage. In addition to Franklin and Morris, Walton also earned honorable mention recognition. Boasting a South Carolina offer, Pierce County offensive lineman Avery Jernigan, a class of 2020 talent, also stood out. In many ways prototypical at nearly 6'5'', 280 pounds, he excelled with good footwork and mobility in drills. Jernigan is a savvy football player. All group partcipants at the ESPFC showed promise and potential. Add in more top prospects like Warren McClendon of Brunswick and Dylan McMahon from Savannah Christian and southeast Georgia has a number of the premier offensive line recruits in the state and beyond. Long known for producing dynamic athletes, the Georgia coast is now developing a more powerful reputation as well.